Introduction: The most frequent complaint of the cochlear implant users has been to recognize and understand the speech signal in the presence of noise. Researches have been developed on the speech perception of users of cochlear implant with focus on aspects such as the effect of the reduction to the signal/noise ratio in the speech perception, the speech recognition in the noise, with different types of cochlear implant and strategies of speech codification and the effects of the binaural stimulation in the speech perception in noise. 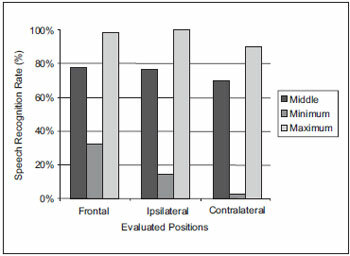 Objective: 1-To assess the speech perception in cochlear implant adult users in different positions regarding the presentation of the stimulus, 2-to compare the index of speech recognition in the frontal, ipsilateral and contralateral positions and 3-to analyze the effect of monoaural adaptation in the speech perception with noise. Method: 22 cochlear implant adult users were evaluated regarding the speech perception. The individuals were submitted to sentences recognition evaluation, with competitive noise in the signal/noise ratio +10 decibels in three positions: frontal, ipsilateral and contralateral to the cochlear implant side. Results: The results demonstrated the largest index of speech recognition in the ipsilateral position (100%) and the lowest index of speech recognition with sentences in the contralateral position (5%). Conclusion: The performance of speech perception in cochlear implant users is damaged when the competitive noise is introduced, the index of speech recognition is better when the speech is presented ipsilaterally, and it's consequently worse when presented contralaterally to the cochlear implant, and there are more damages in the speech intelligibility when there is only monoaural input. The speech sounds perception capacity development of the sensorioneural hearing impaired individual is a challenge for all professionals involved in the clinical and educational audiology area, since the speech is present in the people's everyday life and plays a crucial role in the human relationships. Researches aim at improving the sensorioneural hearing impaired speech perception quality. Technological advances have been allowing an enhancement of signal processing strategies in the multichannel cochlear implants (CI), which offers a better performance to speech understanding (1, 2). However, the most frequent complaint of the users of such devices has been that of recognizing and understanding the speech signal at the presence of noise (3, 4, 5). The noise is defined as an undesirable sound and is present in a number of environments. The interference of the noise with the speech may be expressed by means of the signal/noise (S/N) ratio, defined as the difference between the speech signal level and the noise level. 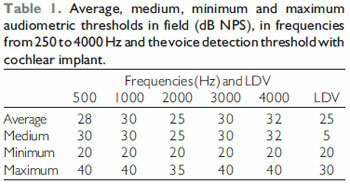 Several authors show a favorable S/N ratio for the hearing impaired would be around + 15 decibels (dB). One for concerning points regards the speech perception, for the users of implant system, under unfavorable conditions, such as in the presence of reverberation and competitive noises (3, 6). In addition, the cochlear implant patients feel the hearing process from a monoaural electric stimulation, and, as a consequence, they report difficulties in the sound localization. The explanations for the difficulty to understand the speech in the noise for sensorioneural hearing loss patients are: the noise, that works as a masking; the loss of binaural integration, that increases the signal/noise ratio at 3 dB or more; the difficulties in the temporal and frequencies resolution: the reduction of the hearing dynamic field and the effect of masking the low frequencies energy (vowels) on the medium and high frequencies thresholds (consonants). The negative influence of noise may be justified from the following contents: the monoaural input to the hearing system does not allow the possible noise reduction processing in a binaural auditory system (7). Nature is very persistent in the fact the hearing is a binaural process. In a relatively open space, the natural hearing may be taken as a type of "triangulation" process, in which the sound source is located by the relative distance between both ears. The binaural conditions may be both diotical (an identical stimulus presented to each ear) and dichotical (different stimuli in each ear), that is, both ears receive simultaneous stimulation. The nature's preference is always the dichotical hearing (8). The key-aspects of the binaural hearing are the use of magnitude and phase interaural differences as a track to support the location and selection processes. The time or phase tracks operate in the region of up to 1500 Hertz (Hz) and due to the lowest length of high frequencies sound waves, the interaural magnitude or the intensity are the dominant tracks for the hearing system. The hearing experience is actually a product of the cerebral cortex, which attempts to locate the sound sources and "tell them". The intensity interaural differences are strongly reliant upon the frequency, as well as the precise angle of the contralateral sound. Therefore, there may be 10dB for frequencies above 2KHz, in which the head size exerts a significant sound shadow. The time interaural differences may be used to solve directional source differences as slight as one or two degrees under experimental conditions. This is a feature that indicates the parallel processing of the auditory neurological system, which is sensitive to time differences, is of 10 microseconds. Once the synaptic retardations are normally of one millisecond, this may be done only by means of a single binaural codification, probably in the superior olivary complex in the brain stem. This is another indication the binaural processing is crucial for hearing. The improvements in the speech perception depend on the binaural neural processing mechanisms reproduction possibility, which are very sensitive for phase differences between the ears and essential for the detection of the signal in the noise. A monoaural listener would have a considerable disadvantage when the noise in beside the best ear. It's known that when the noise is separate from the speech signal, the normal listener may reach the same intelligibility with a noise level higher than when the noise and the speech are coming from the same source. Two components contribute for the binaural intelligibility difference: head shadowing and binaural interaction. The ear opposite to the noise (shadowed ear) has a better signal/noise ratio because the high frequencies components of the noise are mitigated by the head shadowing (9). The abilities of the individual evaluated to lateralize the sounds based on the interaural delay or intensity differences, combined with the consonants identification results, justify the use of binaural stimulation to improve the speech perception capacity in the noise of the cochlear implant users (4, 9, 10, 11, 12, 13). Several researches have been developed to analyze the speech perception of cochlear implant users with focus on aspects such as the effects of a reduction in the signal/noise ration in the speech perception, the recognition of the speech in the noise, with different kinds of cochlear implants and strategies for speech codification and the effects of the binaural stimulation in the speech perception in the noise. A study (14) evaluated the speech perception of 96 adult patients implanted in the silence and noise scenarios (S/N +10 dB and S/N +5dB). In the silence situation there was 88% of words hits, in the noise situation and S/N+10dB there was 73% and in the S/N ratio +5dB, 47% of the words were correctly identified. In this study no ratio was found between the time of use and the test punctuation. Researchers have observed the significant influence of the time of use of the CI in the evaluation of adult users of cochlear implant in the CPA sentences recognition indexes, because the longer the time of use the higher the CPA sentences recognition indexes are. 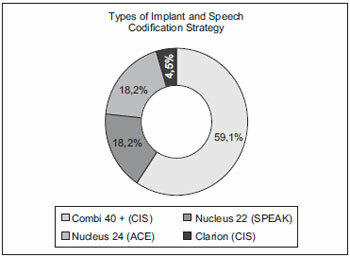 And as for the influence of the speech codification strategies, there were no significant differences in the sentences recognition CPA with cochlear implants Nucleus 22 (SPEAK strategy), Nucleus 24 (ACE strategy), Combi 40, Combi 40+ and Clarion (CIS strategy), in silence and in the S/N ratios +5db, +10dB and +15dB. As for the speech codification strategy, the researchers justified the absence of statistically significant differences between the strategies, in the sentences recognition, with the facility of evaluation material; they ascribed the CIS strategy higher performance in the consonants recognition to their high stimulation speed (more than 800 pps) (15). A study (16) researched the performance of 20 cochlear implant and hearing aid users in the ear contralateral to the implant in the speech perception and tests of sound localization. The researches tested the words understanding abilities in silence and sentences in the noise at the use condition only from the hearing aid and only from the cochlear implant and with the combined use of both, and tested the sound localization only in the condition of combined use of cochlear implant and the hearing aid. All speech stimuli were presented at the frontal position, and the noise presentation ranged between frontal position (0o azimuth) and at 90o azimuth to the right and left, and the speech stimuli were presented at an S/N ratio of +10dB. The results showed the benefit of the combined use of the cochlear implant and the hearing aid for speech perception in the presence of competitive noise and sound localization. Scholars have compared the performance in the cochlear implant users speech perception under the conditions of use of this unilateral device and bilaterally. They applied words and sentences recognition tests with and without competitive noise in different conditions to exploit means to better differ the binaural stimulation benefits. The results indicated that variable conditions of speech perception tests may indicate a more significant benefit in the binaural use of the CI (17). A study has compared the use of directional microphones with the standard microphone in cochlear implant users in the speech perception in silence and with background noise. The use of directional microphones showed a higher benefit in the speech recognition with background noise compared to the use of standard microphones (18). The objective of this study is to assess the speech perception in adult users of cochlear implant, in different position as for the presentation of the stimulus; to compare the speech recognition indexes at frontal, ipsilateral and contralateral positions, and to analyze the effect of monoaural fitting in the speech perception with noise. This study was accomplished in Research Center and was approved by the Ethics Committee in the Institution Research, to which its is bound, under process number 079.2004 and all individuals signed the Free and Clear Authorization Term. We first carried out a preliminary study with normal listener adults, to validate the evaluation protocol and set forth reference values, as for the speech recognition in silence and in the noise at the different positions proposed. We selected 05 individuals in the age range from 18 to 60 years, with normal hearing and submitted to the same procedures of evaluation used with the cochlear implant adult users: recognition of sentences in the noise with S/N ration +10 db, at frontal, contralateral and ipsilateral position beside the implant. Within the number of patients implanted attended at the Institution, 22 adults were selected with postlingual hearing impairment; users of cochlear implants (Nucleus 22, Nucleus 24, Combi +40 and Clarion), with more than 1 year of experience of use of the cochlear implant and with open set speech recognition. In the evaluation situation, the participants used only the cochlear implant, without the use of contralateral hearing aid. In the speech perception evaluation accomplishment we used the two-channel audiometer "Midimate 622 - Madsen Electronics", connected to an amplifier in a free field and an acoustic box. The sentences were recorded in the direct channel in a digital compact disk (CD) and the speech noise in the other channel. The competing noise includes sound energy of the speech sounds removed from the own sentences presented. The speech perception evaluation procedures in the presence of competing noise were made in an acoustic cabin of 2.00 m x 2.00 m. We measured the speech sound pressure levels and the noise that reached the individual evaluated. The audiometer attenuator was fixed at a given value, at the hearing level, and the speech was presented by means of a loudspeaker. The sound pressure measurer was positioned one meter distant from the loudspeaker, at 0o and 90o azimuth (degrees). By using the sound pressure measurer "linear" scale we observed the average levels of the peak of speech. The value set in the audiometer attenuator was derived from the average values of the peaks of speech. This difference obtained was used as a constant for correction between the value, in auditory level, shown in the attenuator display and the sound pressure level (SPL) obtained in free field. All audiometric appliances meet the calibration norms according to ANSI S3.6 - 1969/89 S.3.13 - 1072; ISO 389 -1975/83 ; IEC 645. In the first moment we made the evaluation of the external component (speech processor, antenna, microphone, wires) and the internal component, in order to discard any technical problem with the device during the exam. After technical evaluation audiometric was carried out in a free field of frequencies of 500, 1000, 2000, 3000 and 4000 Hz and the voice detection threshold (VDT) was researched. The speech perception evaluation was made with the speech processor programming used for longer and mostly suitable for the situation of the noisy environment speech, described and chosen according to the patient's preference. The sentences were presented at each side proposed with the individual at 1m from the loudspeaker, at the intensity of 65 dB with competing noise presented in the same acoustic box with fixed intensity of 55 dB, and then the signal/noise ratio +10 dB was obtained. Such sentences are composed by 3 lists, composed by 30 sentences (10 sentences in each list) formed by simple period containing from 4 to 7 phonological terms. 10 sentences were presented at each position proposed, at random for each presentation order: Box in front of the patient (0o azimuth degree), ipsilateral to the implanted side (90o degrees) and contralateral to the implanted side (90o degrees). The patient was prompted to repeat the sentences and the result was calculated by the identification of the words repeated correctly. The results described regard the speech recognition index with competing noise at the three different positions evaluated. Despite the main objective of this study was not to correlate etiology, type of implant, speech codification strategy, audiometric thresholds in free field and speech detection thresholds with the speech recognition index in the noise, the importance of describing them was timely. In Table 1 we observe the average, medium, minimum, maximum audiometric thresholds in field and those of thresholds for voice detection, irrespectively of the cochlear implant type. We observe that despite the different types of implant, the audiometric thresholds were not higher than 40dB, and the voice detection thresholds were not higher than 30 dB, which then offered the test an ideal condition of audibility. 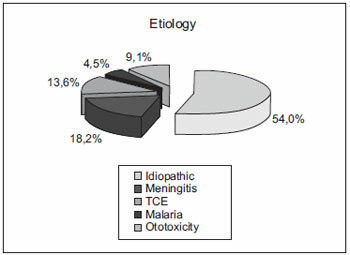 Graphic 1 shows the distribution of individuals as for the hearing impairment etiology. Graphic 1. Distribution of individuals as for the hearing impairment etiology. CET: Cranial-Encephalic Traumatism. In Graphic 2 we observe the distribution of the individuals as for the type of cochlear implant and the speech codification strategies used in each processor. Graphic 2. Distribution of individuals as for the type of implant and speech codification strategy. SPEAK: Spectral Peak. In Graphic 3 we observe the medium, minimum and maximum indexes for sentences recognition at S/N ratio of +10 dB at the frontal, ipsilateral and contralateral positions concerning the cochlear implant. In this picture it's possible to view a diminishment of the sentences recognition indexes at the contralateral position. The lowest sentences recognition index was found at contralateral position (5%) and the highest sentences recognition index was obtained at the ipsilateral position (100%). Graphic 3. Medium, minimum and maximum indexes of sentences recognition, at the frontal, ipsilateral and contralateral positions with cochlear implant. Ipsi: Ipsilateral Contra: Contralateral. In order to compare the results in the three different conditions, we used the Friedman and Dunn's parametric test. The results obtained in the sentences recognition evaluation, in the hearing scenarios of S/N ratio +10dB, proved to have significant difference between positions: frontal, ipsilateral and contralateral positions researched in this study. The ipsilateral position was the condition where we obtained the highest sentences recognition index. In this position the highest index was of 100% of sentences recognition. Therefore, the speech and the noise were presented at the same side as of the cochlear implant. We observe in this position there was no physical obstacle that prevented the sound energy to be captured by the microphone, perhaps for this reason the performance in this condition was always better. According to a study carried out with research on the head shadow effect in implanted patients, obtained through excision of the ipsilateral and contralateral LFR, the highest speech recognition index was at the ipsilateral position (19). In the frontal condition, it was not possible to note significant difference between the ipsilateral condition. The highest sentences recognition index at this position was of 98% and the medium was 77%, identical to the frontal position. Maybe because the microphone of al types of cochlear implants researched was of the directional type, there was no damage as for the capturing of sounds originated in front of the patient (6, 18, 20). The use of directional microphones also offers an important increase to the speech understanding in the noise. Improvements in the directional microphones designs, common nowadays, offer an increase of 5 to 6 dB in the signal/noise ratio. This may be translated into 60% of increase in the performance at distinguishing the speech for some hearing impaired (21). In the contralateral condition, we obtained the lowest punctuation at minimum, maximum and medium sentences recognition indexes. At this position the minimum obtained was 5%, the maximum, 90%, and the medium, 69%, of sentences identification. All indexes researched in this condition were lower than those of other evaluations. The results of this study are according to several studies that also concluded that the speech perception is effectively damaged when a competing noise is introduced (22). Such difficulty is added mainly when there is only monoaural input. Some studies confirm the benefit and the improvement of the speech perception with competing noise when there is binaural integration. Such benefit of the binaural integration may occur both with the use of hearing aid at the contralateral side and with the use of bilateral cochlear implant (2, 16, 23, 24, 25, 26). As for the use of contralateral hearing aid, a study has evaluated the benefit of the hearing aid at the contralateral side to the cochlear implant. To evaluate the speech perception, we used the J-HINT sentences and list of monosyllables in three situations: CI + Hearing Aid, Hearing Aid e CI alone. Both in silence and in the noise, there was a higher punctuation in the tests with monosyllables and sentences with the use of CI and Hearing Aid. However, in the situation with noise, the highest punctuation occurred when the noise was introduced at the hearing aid side (contralateral to the CI), due to the head shadow effect (27). Scholars evaluated the speech perception results obtained by 4 users of multichannel cochlear implant in the use conditions of only the CI, only of hearing aid and of CI plus the hearing aid. The results obtained in the CPA sentences recognition in silence were always higher than the S/N ratio +10dB. The best results of speech perception were obtained in the condition of CI plus hearing aid. As from such findings, the authors recommend the use of hearing aid in the ear contralateral to the cochlear implant, due to the benefits for the speech perception, although there is no improvement of tonal thresholds obtained in this condition (28). As for the benefit of the bilateral cochlear implant, researchers have studied the sound localization and the speech perception in adults and children using bilateral cochlear implant. 17 implanted adults were evaluated. As for the sound localization assessment, the authors verified that in the situation with the use of cochlear implant in both ears, the sound localization was facilitated. For the speech intelligibility evaluation we used a list of sentences with 8 to 10 words in the decreasing S/N ratio. The speech was presented in several levels until obtaining 50% of correct words. The authors verified that, in all individuals evaluated, there are benefits in the use of bilateral cochlear implant for the speech intelligibility (29). Researchers reported the results of bilateral cochlear implant in 10 children aged from 3 to 14 years, upon the second surgery. All used the bilateral retroauricular processor and began to present a good performance at school and an improvement in the quality of life, related to the speech understanding (mainly in the noise) and sound localization improvement (30). As from the results obtained in this study, we may conclude that: 1 - the speech perception performance in implanted individuals is damaged by competing noise, no matter the site it's presented; 2 - the speech recognition index is better when the speech is presented at the side of the cochlear implant and consequently worse when presented at the contralateral side of the cochlear implant; 3 - there is a larger damage to the speech intelligibility with only monoaural input. 1. Specialist in Clinical and Educational Audiology at the Craniofacial Anomalies Rehabilitation Hospital of the University of São Paulo (HRAC-USP) and Master's Degree in "General Bases of Surgery" at the Medicine College of the Universidade Estadual Paulista "Júlio de Mesquita Filho" (UNESP - campus Botucatu - SP). Clinical Phonoaudiologist. 2. Doctor's Degree. Head Professor of the Universidade Estadual Paulista Júlio de Mesquita Filho and Guest of the University of São Paulo - USP - Bauru - SP. 3. Graduation in Phonoaudiology. In course for Specialization in Clinical Audiology at the Institute of Communication and Hearing - ALFA - Bauru. 4. Post-Doctoral Degree. Head Professor of the Phonoaudiology Department and Professor of the Post-graduation Program of the University of São Paulo. Institution: Centro de Pesquisas Audiológicas (CPA) - Hospital de Reabilitação de Anomalias Craniofaciais da Universidade de São Paulo - HRAC-USP. Bauru / SP - Brazil. Article received on October 13, 2008.